One of my good friends has a birthday in December and I have a tradition of making a unique gift tag for her birthday present which she keeps and hangs up on her Christmas tree. 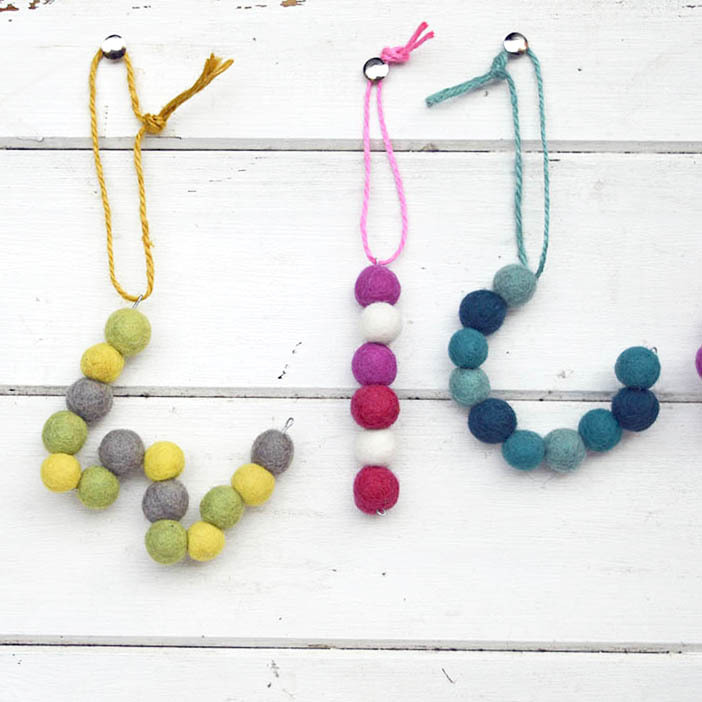 This year I made her a colourful felt monogram gift tag. Last year I made Wendy a upcycled monogram denim gift tag, this year I carried on with the monogram theme but this time in felt. 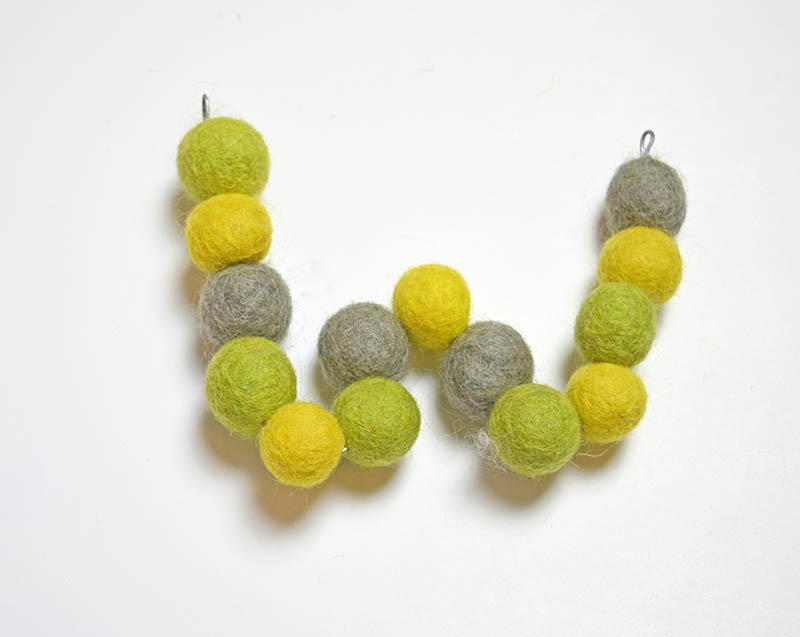 Rummaging through my craft cupboard, I came a across a jar of gorgeous colourful felt balls left over from my felted acorn wreath. 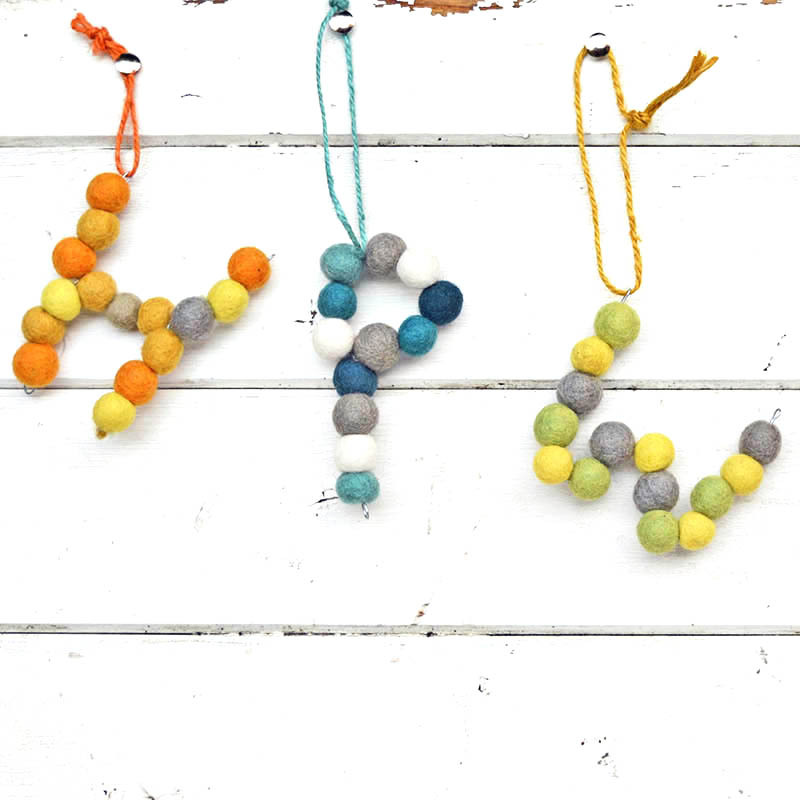 I decided to use these balls to make a felt monogram gift tags. 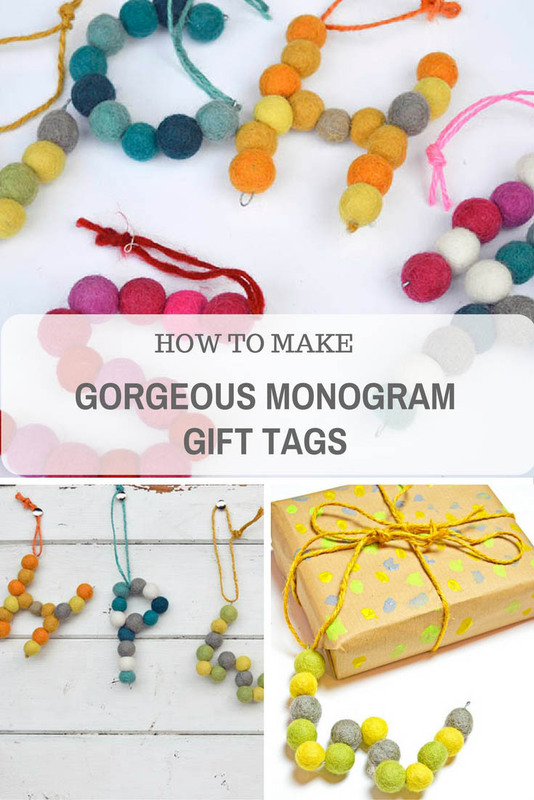 I was so pleased with how the monogram gift tags turned out that I decided to make a load more to put on my Christmas gifts for friends and family. 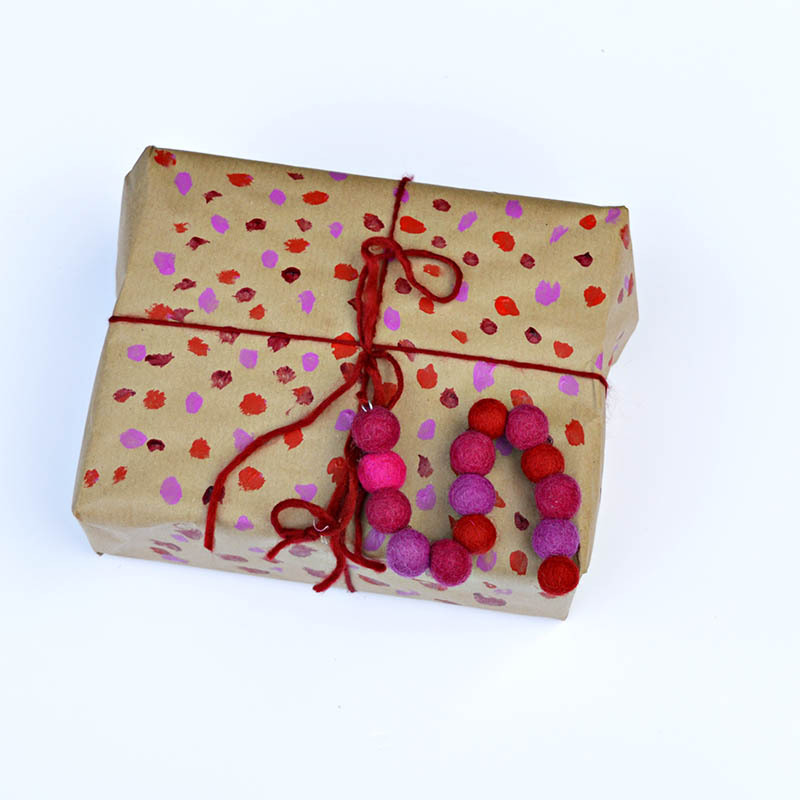 The gift tags make a lovely present topper especially if you paint your wrapping paper to match. 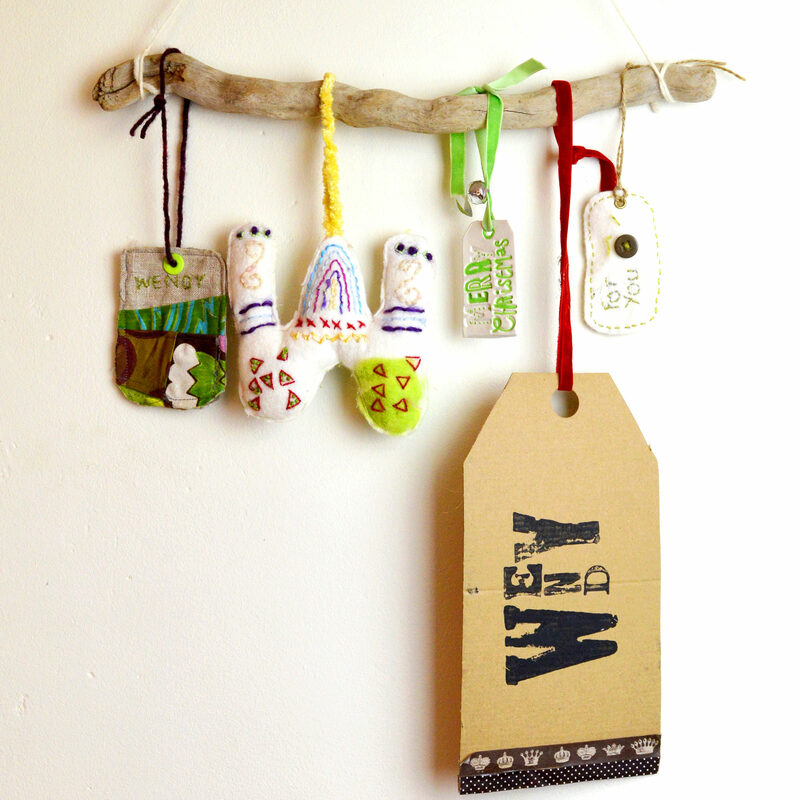 Afterwards, you can hang the felt monogram gift tag as a tree decoration, use it as a keyring or even a bag charm. For the matching wrapping paper..
First decide on what letter you are going to make. Some letters like W, N, O, C etc can be made in one piece others like H, E, and T will need to be made in 2 pieces. Once you have chosen your letter, cut your wire to a manageable length, slightly longer than your monogram gift tag. 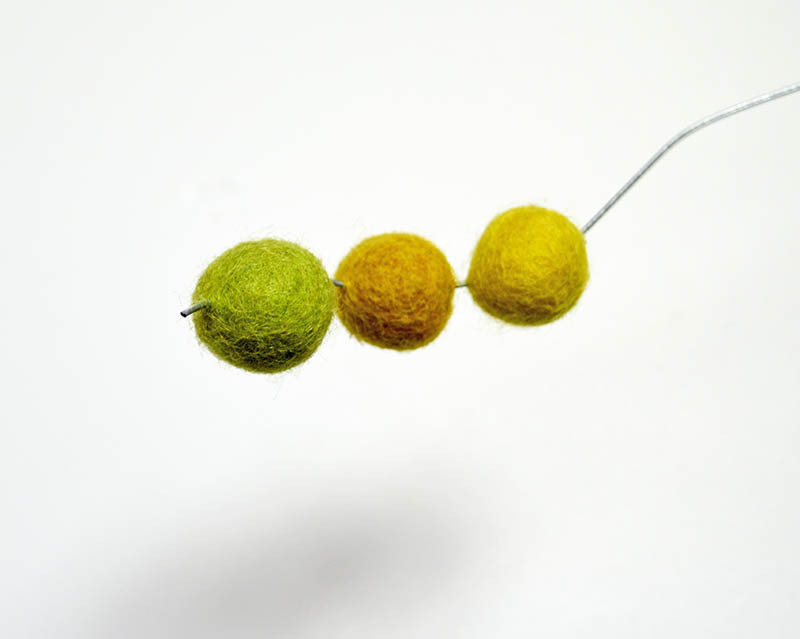 Thread your felt balls onto the wire. 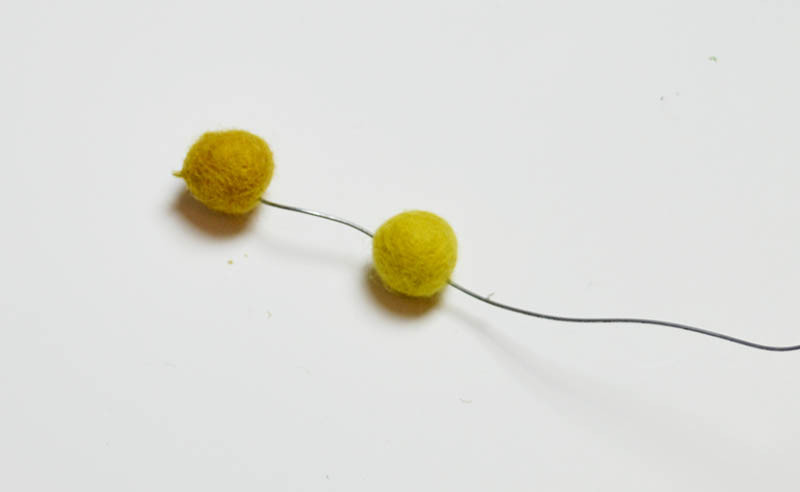 This is slightly tricky as it may seem that the wire won’t penetrate the felt balls. However, if you wiggle and twist the wire it will work its way through the felt. 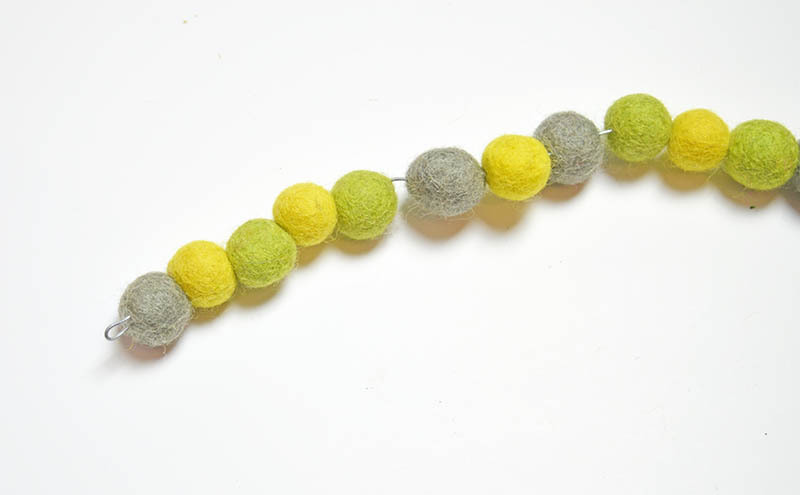 Carry on threading the felt balls onto the wire until you have the amount you need. 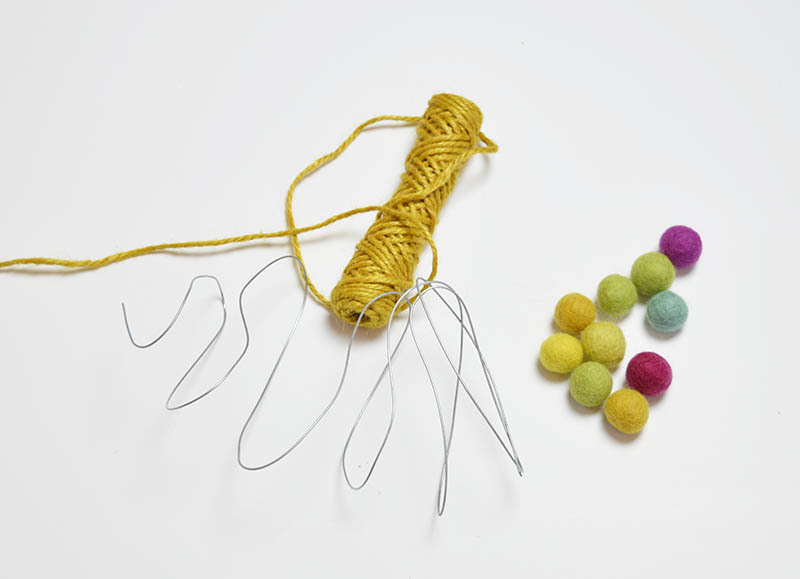 You can shape the wire as you go along to get an idea of how many balls to thread. For the W I used 14 felt balls, for the C 10 and for the I only 6. 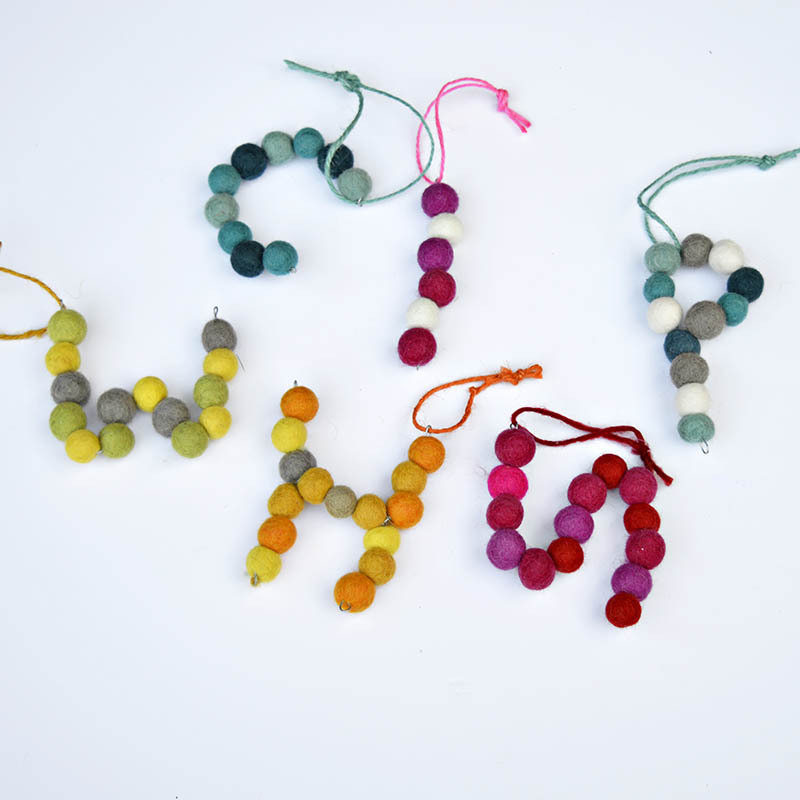 When you are happy with your design, twist over the end of the wire and wiggle it into the end felt ball to make a loop. Repeat with the other end, you may need to trim your wire. Bend into shape and don’t forget to add a matching twine loop for hanging. For a more impressive effect and to make your gift look even more special use matching wrapping paper. This is a lot cheaper and simpler than you think. 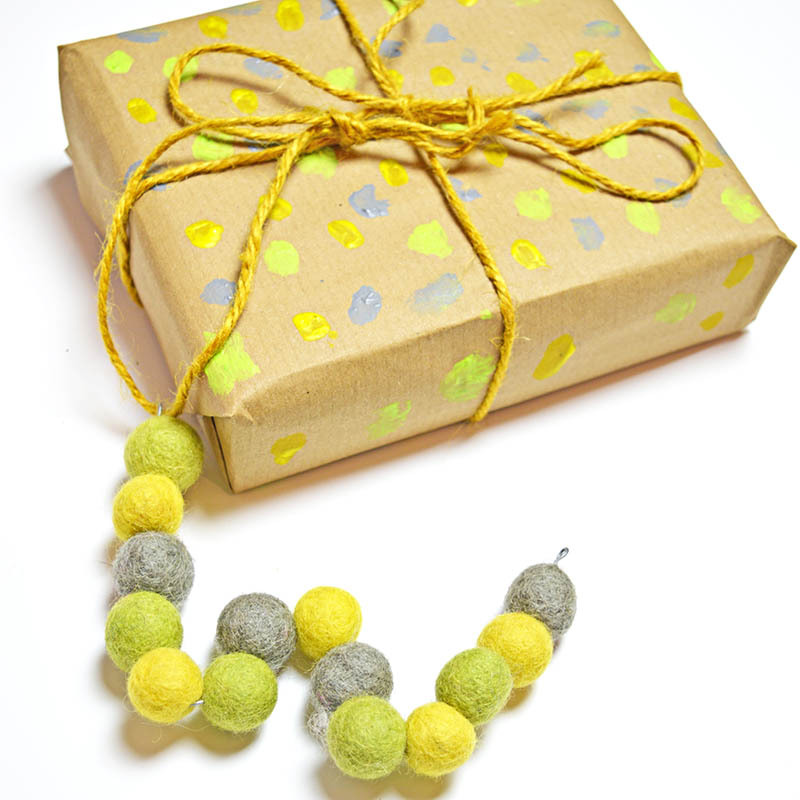 Simply wrap your present in plain brown kraft paper and then paint dots on the paper the same colours as the felt balls used in your gift tags. These are so cute! What a great idea, too. Thanks for sharing at Funtastic Friday. 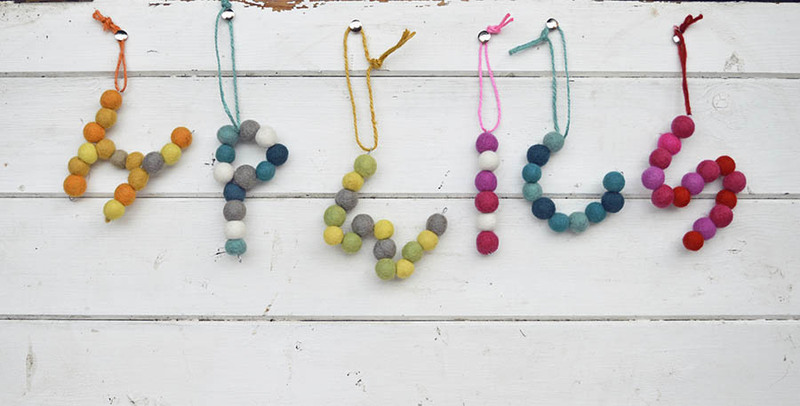 These are so cute, I love the idea of tags that can become decorations or even something else. Just darling, Claire! Thank you for sharing @Vintage Charm! Very pretty! Thank you for sharing them at The Crafty Corner! That’s really, really cool Claire. So simple but they make such amazing gifts and customizing the wrapping paper to fit just adds more “special-ness”. Thank you so much Michelle, they also make the presents look colourful under the tree. Great ideas! And thanks for sharing them on the Pleasures of the NW’s DIY party! Cute idea Claire! Tweeted. Visiting from Homemade and Handcrafted party. Thank you and thanks for the tweet.